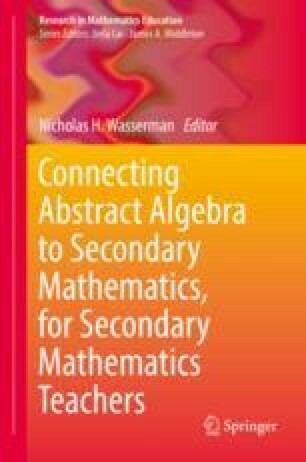 This chapter details a teaching experiment in which a pair of prospective secondary mathematics teachers leverages their knowledge of secondary algebra in order to develop effective understandings of the concepts of zero-divisors and the zero-product property (ZPP) in abstract algebra. A critical step in the learning trajectory involved the outright rejection of the legitimacy of zero-divisors as counterexamples to the ZPP, an activity known as monster-barring (Lakatos, Proofs and refutations, 1976; Larsen and Zandieh, Educational Studies in Mathematics 67:205–216, 2008). This monster-barring activity was then productively repurposed as a meaningful way for the students to distinguish between types of abstract algebraic structures (namely, rings that are integral domains vs. rings that are not). This chapter makes two primary contributions. First, it illustrates how students might be able to develop abstract algebraic concepts using their knowledge of secondary algebra as a starting point, thus addressing the issue of perceived irrelevance by forging a direct cognitive connection between ideas that are central amongst the two subjects. Second, and more generally, this chapter emphasizes the importance of identifying, attempting to understand, and leveraging student thinking, even when it initially appears to be counterproductive. The chapter concludes with a discussion of the implications for secondary teacher preparation.